Online pokies have become very popular over the last decade due to the fact that the games are in many ways better than the ones you'll find at your local pub, club, RSL or casino. The main differences are higher game RTP's and much bigger jackpots that can go into the millions. We've reviewed all of the most popular poker machines so you can quickly compare the games. Our in-depth reviews cover all of the aspects of the games from betting limits to features to the jackpots you can win. If you're looking for a particular game then you can use the categories below to search by game name, number of lines or software type. 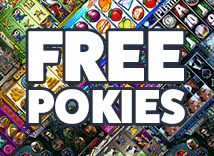 It was possible to play pokies online as early as 1994 although it was not until the mid 2000's that we saw true Australian style pokies starting to become available online. In the last decade the amount of pokies online has skyrocketed to where you now have hundreds of games to choose from. The majority of the games have the same features that you're used to with free spins being the most common feature. Not all of the games have a gamble option so if you like doubling up see the game reviews to find out which titles have a gamble feature. One of the great things about online games is that you have a wide range of betting options. Most games have a minimum credit level of 1c so you can be spinning for just a few cents per spin. The limits also go higher than pub or club games so if you like betting big you have lots of options. Game RTP's are much higher online with an average of over 95%. The jackpots are much bigger and can go into the millions. You can easily set limits on how much you want to spend.